Infested Planet: 20,000 kills, 20 minutes | SPACE-BIFF! The situation in the mines (click to embiggen). 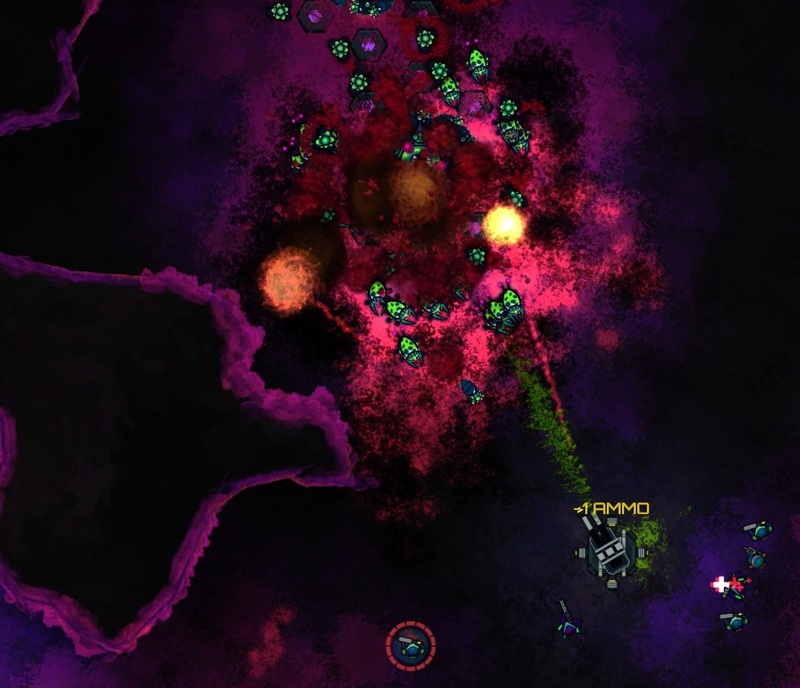 In Infested Planet, there are countless ways a battle might evolve. The bugs mutate from creeping slugs to something much faster; the marines start using bomb strikes. Spore towers begin hurling their acidic phlegm so far that your men can’t get into range without their armor melting off; you hand out the sniper rifles. Armored bugs begin trudging towards your faltering line; robotic drones hold them off with tungsten scythes. 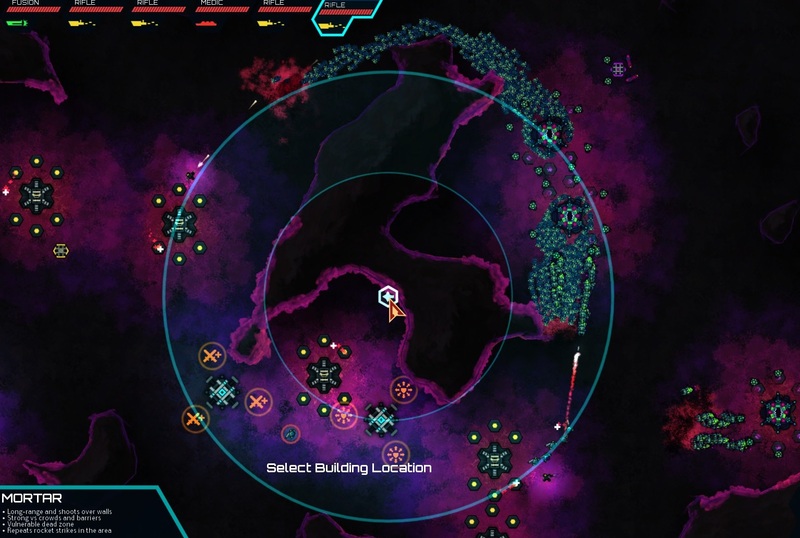 No matter what goes down, every battle begins with a quick and desperate scan of the field as you try to parse every detail, every byte of information: the layout of the cavern, the probable avenues of attack to defend against, which hives are currently active, the likeliest early targets of opportunity. The answers you come up with might be the difference between success and failure, but they’re very rarely obvious. In this case, our guys are in a pretty good spot at the southwest. There’s a gigantic bit of stone in the center that divides the mines into distinct chambers, which should help us contain the infestation as it fights back against our advances. There are nine hives, some of which are clustered in pairs — those will be the hardest to dislodge. And our position, while relatively well-founded with our backs to a wall and a pillar blocking quick access from the eastern hives, is still vulnerable from the north and southeast. Fortunately, only two hives, one in the north and one to the east, are aware of our presence and spitting out slugs, which are creeping towards our single point. If we lose that, we lose the battle. Good thing then that both groups are coming at us from such an angle that we can defend it from a single spot. Five brave souls secure their starting position. Taking stock of our resources, we’ve got a scant five men and fourteen battle points, which we can spend on all sorts of stuff. As we take over more hives, we’ll get more points to spend (life as a professional bug-hunter is tough like that), but for now we’ll start with the basics: a turret a short ways off from our base to keep the bugs at bay, and a fusion shotgun upgrade for one of our soldiers to replace his trusty assault rifle. 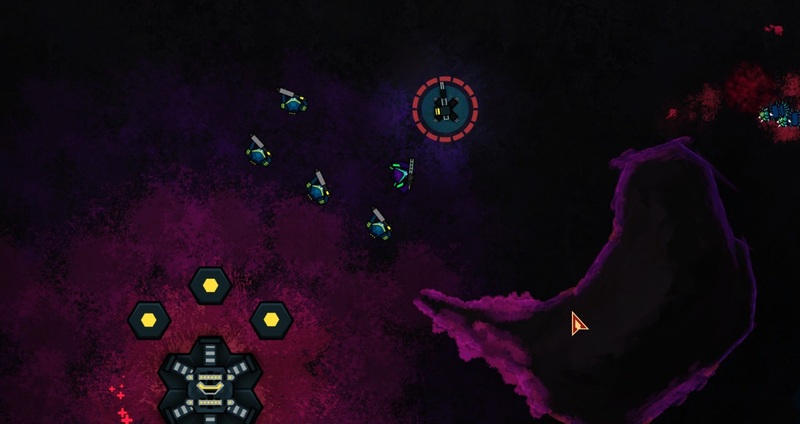 Seeing as how fortune favors the bold, especially when being timid just leads to more bugs before you’re ready for them, I issue my squad an attack-move order for the two hives just north of my position. Eventually the bugs will evolve a whole mess of new traits, but for now it’s an easy task to blast our way up to those hives. What isn’t so easy is taking down the hives themselves — they take a whole lot of punishment, so the best we can do is bring down one of them and then just sort of hold on while one of my guys runs back to base to set up a newly-funded grenade outpost. As soon as it’s up our guys finish off the hive with an overkill of hand-bombs and take the point. Two down, seven to go. The downside is that the hive has just gained its first mutation. These are randomly assigned, though there seems to be a scale that starts out with weaker ones and gradually builds up to tougher problems to solve. For now, this mutation doesn’t seem like a “weaker one”: it’s “counterattack,” and it means that when they lose a hive, the aliens go into adrenal overdrive and surge forward in an attempt to retake their lost territory. In this case, it means my soldiers are now facing a rush of bugs from the north and southeast at the same time, so I split them up to handle it, two in the north and three down below. Thankfully, even though the bugs are faster, they’re still just slugs, so we stamp out the counterattack in no time. With the BPs I just earned from taking the second hive, I train one of my riflemen into a medic. Turns out, in Infested Planet, medics don’t only talk endlessly about bioethics and heal people. They also carry grenade launchers. The next hive, just to the east of our starting position, falls with little resistance, even with one of our guys stationed as a rearguard to keep the bugs from overwhelming the other two points we just acquired. This new point is within spitting distance of a real problem: two hives tightly packed together and spitting out a huge volume of slugs. They even work well together, seeing as how the one in the north spawns extra bugs and the other is defended by suspiciously phallic goo-hurling towers. Oh, and the newest mutation is “hive spit,” which means those hives now pack a bit of a punch. As expected, the counterattack is scathing. Our guys are hurting, and even with the bonus battle points from taking this last position, we could use a few more. Fortuitously, there’s a resource crate to the south, protected by a few proximity bug-spawners. My guys leave the base for a bit to grab the crate, and battle their way back right before the bugs push past the perimeter our new turret is enforcing. With a few more BPs at the ready, we set up a reinforcement point, meaning we now have six marines instead of just five. After recycling our current defenses, another turret frees up the dude who was stemming the tide of bugs in the north, so we’ve got a full complement ready to assault the twin hives. The assault is bloody, and not only because our combined assault explodes the northernmost of the twin hives in short order. The hive spit corrodes armor faster than our medic can repair it, and we barely manage to jump on the point and capture it when four of our marines become KIA statistics. A single medic and rifleman hold the point while everyone else slowly reinforces back at the previous point, but soon they too become numbers in a ledger when the new mutation is announced. It’s “brute guard,” and it means that there are some new heavy slugs in town. Not only are they tougher and slower, their carapaces also reflect some of my marines’ projectiles back at them, and when a grenade bounces back in your face, it means you’re one dead medic. Luckily, while the bugs are busy retaking their point (which would be horrible, as hives will eventually regrow to provide a whole new set of slugs to fight), my troops are regrouping a short distance away. I upgrade with a the “dispersal” tech structure — now my guys have better armor, damage is dealt slowly instead of all at once, and, best of all, groups of marines now share health, so it won’t be possible for hive spit and goo towers to pick them off one by one anymore. Reinvigorated, my new squad surges forward and stops the bugs from retaking our point. We also kill the other twin hive in the process, securing the area for the time being. The updated situation (click to embiggen). There are only four hives left, but they’re going to be tougher than anything our boys have faced so far. Except for the isolated one in the east — that will be pretty easy. Still, we have another double cluster on the other side of the rock formation, and I’m dreading the push against that. Thank goodness I can at least soften that region up a bit before I head in! Giving no thought to how it operates in a mine, I set up a mortar that will fire over (?) the rock formation right into the thick of the hive cluster to the east. It fires slowly enough that it won’t do much to the hives themselves, but its shells have a blast radius that clears out slugs nicely. The only critters to survive the barrage are the brute guards, but they’re slow enough that I rush my marines to the east, mop up the lonely hive over there, and come back with plenty of time to intercept before they can do any harm. Now that the mortar has done its job keeping the horde off our guys’ backs, it’s time to recycle it and set up something even better: a siege cannon. This baby has a long enough range to strike both hives, and enough firepower to level nearly all comers. Between that and our six guys, clearing out the infestation is a simple matter. Or it would have been had the aliens not evolved “virulence,” meaning medics are now worthless when it comes to curing poison. Since there are plenty of hive defenders that deal poison damage, quite a few marines give their lives in the slog against the cluster. It takes much sacrifice, and a bit more time, but our siege cannon means the slugs can never quite recoup their losses, and both hives are eventually buried beneath a slagged heap of progress and technology. We falter for a moment when our celebrations are interrupted by a brand new hive erupting from the ground right in the midst of our squad. Turns out we forgot to capture the point and salt the earth after the hive was destroyed the first time. Another marine dies thanks to the thirty slugs that spawn right on top of him, but we manage to raze the hive again and make sure it’s gone for good this time. The bugs mutate the power of regeneration, but it’s too little too late. I’m able to finally cut off the tide of slugs flowing through the northern passage to my earliest acquisitions, and between a repositioned siege cannon and a few more upgrades — including a minigun for one of my marines — there isn’t anything the bugs can do but wait for their doom to roll into town. I oblige them. In a mere 17 minutes and 49 seconds, we’ve managed to wipe out 21,108 bugs. The fact that we lost 20 soldiers and two of our structures to do it is immaterial. After all, someone’s got to make sure these infested planets get cleaned out. 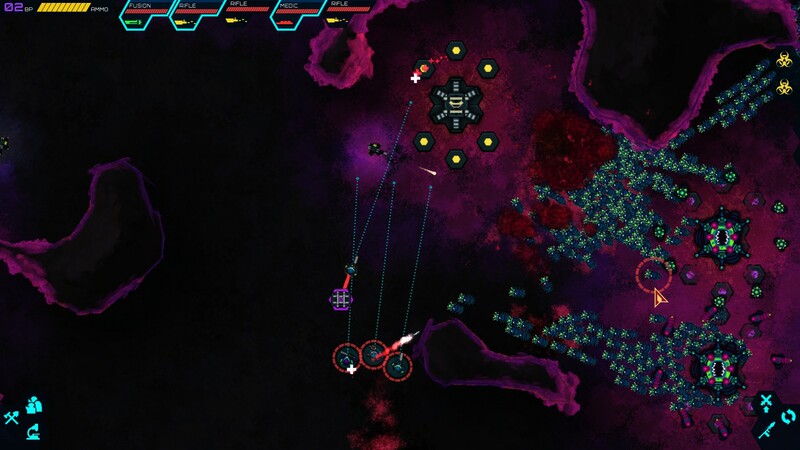 Posted on July 5, 2013, in Game Diary, Reviews and tagged Indie, Infested Planet, Rocket Bear Games. Bookmark the permalink. 5 Comments. 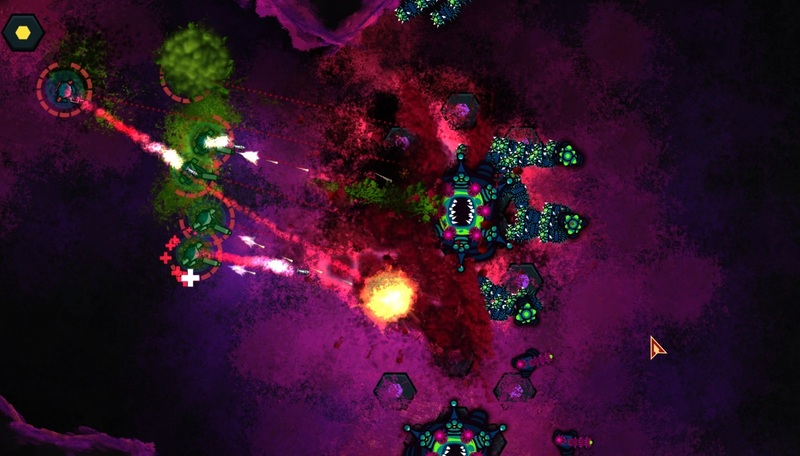 Thanks a lot for this article, is was a good read and let me discover a really nice game ! 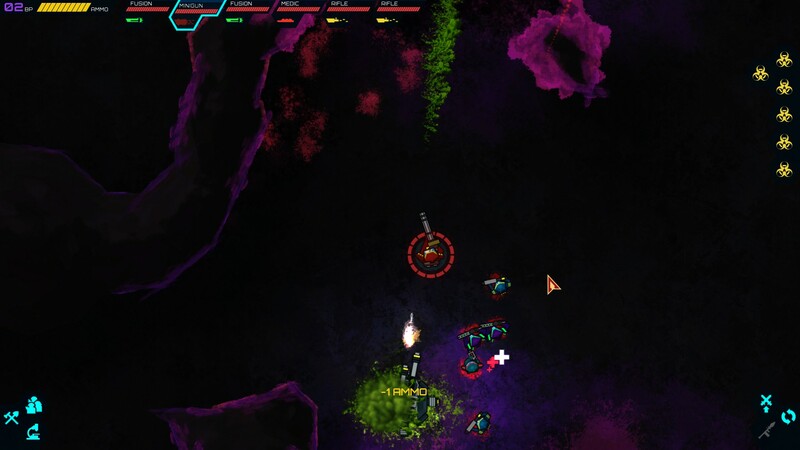 Hi Tiax, glad you liked the writeup and Infested Planet! Sounds like a good time. I’ll be sure to get more Space Marines dead, they just sit around and do nothing on their off time anyway.